Tanks, synonymous with the landscape of war, are instrumental war machines in the propagation of western supremacy. Pagoda, adorned with lotuses and often part of a temple compound, believed to be the padmasana, the seats of gods and goddesses who rule this world, is the shape of temples and a symbol for the levels of pure love in Eastern cultures. This work expresses the interaction between the East and West cultures – an interaction which often ends in clashes. The adaptation of these cultures is symbolised through the visual language of seven tanks stacked on top of one another forming a tall structure resembling a Pagoda. 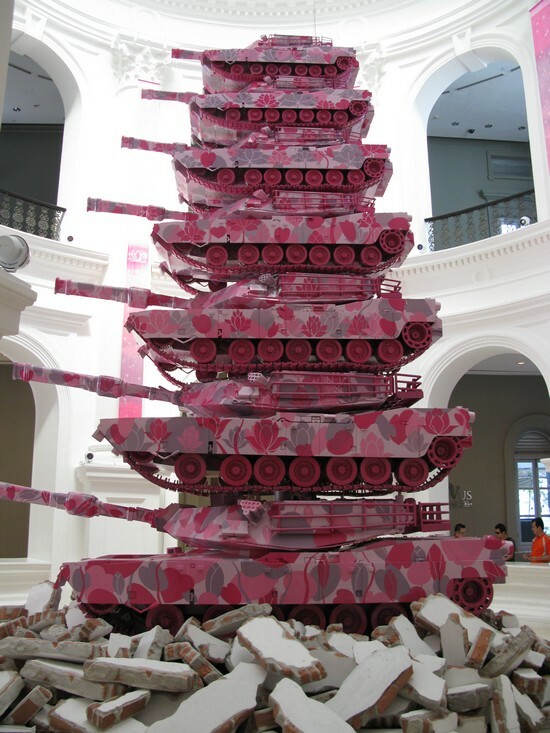 The tanks are decorated or camouflaged with red lotuses and the juxtaposition transforms the killing machine into one that conveys love and peace to humankind.